Thirty thousand feet above some fly over state, a woman sits alone at her computer. And by alone I mean sandwhiched between two monstrous, but kind, gentleman. One of them is asleep on my shoulder and the other is watching me type every word, and wondering what in the world I’m doing with an empty protein baggie on my tray table. Well sir, I’m writing my official reviews of Progenex’s top of the line Recovery Protein. I saw top of the line because this stuff is NOT cheap. We will get into the value of Progenex Recovery a little later in the review- but if you’re familiar with the brand then you know that they certainly do not give it away. But guess what? Some of my favorite products are found on the top shelf. I’d even go as far as to say that unless I’m paying a premium, there’s a really good chance that I don’t like it. I’m Fit Life mutha-trucking Allie. I deserve the best of the best. I love how I pretend to be such a snob in these reviews as I rock my Banana Republic Jeans. LOL. So much cooler online- isn’t that how Brad Paisely says it? But anyways. The rambling period of my review, like my vacation in Nassau, Bahamas this weekend, is over. It’s time to get back to business and tell you a little bit about the Recovery Protein Powder by Progenex USA. Let’s start with the flavor, shall we? It’s pretty impressive to me how good these companies have become at flavoring these protein drinks. I’d like to think that I’m an early adopter so-to-speak of protein shakes (early 90’s anyone?). If you were right there with me- you’ll recall that the original shakes we grew up with were a FAR CRY from the taste of the modern-day protein shake. Remember Optimum’s ’24’ blend? How about the original GNC Wheybollic Extreme? They tasted like chalk (the green one), and metal, respectively. Peanut Butter Smash: If you’re here looking for the best flavor of Progenex Recovery, then look no further, because you’ve found it. The best flavor of Progenex Recovery is without a doubt the Peanut Butter Smash. To me, it tastes like butterfinger’s smashed up with some of Teddy’s real Peanut Butter. It’s really quite a delicious tasting protein powder that deserves high praise. If you’re looking for a truly exceptional experience- you’ve GOT to try mixing some actual peanut butter into it with some whole milk and ice. Throw some spinach into the mix to really power it up. Tropical Vanilla: I am partial to peanut butter as you know from reading my blog, but I have to say this tropical vanilla isn’t so bad either. I don’t know that I really got that much of the ‘tropical’ element of the flavor, but perhaps my taste buds were still reeling a little bit from the overwhelming deliciousness of the Peanut Butter Smash that they experienced just minutes before. The Tropical Vanilla flavored Progenex Recovery is silky smooth (both flavors mixed very evenly and quickly), and has a really nice authentic vanilla taste- almost like the Madagascar vanilla that has become so popular these days. Like. Super smooth. I would give the tropical vanilla a ‘B+’ to the Peanut Butter Smash’s ‘A+’. I’m giving Progenex Recovery a high grade on the ingredients because, in staying true to the ‘crossfit’ spirit- it is minimalist yet powerful. As somewhat of a cross-fitter myself, I can now relate to the culture and appreciate the sort of ‘au naturale’ mindset that is often associated with it. There’s just something about taking your body to an absolute maximum effort that makes you want to fuel it with nothing but the purest, most earthy forms of human energy. So poetic, right? But looking at Progenex’s supplement facts panel for Recovery, you can see that culture reflected right there on the label. There are just a handful of ingredients that go into making Progenex Recovery- something you don’t really see in today’s protein powders. 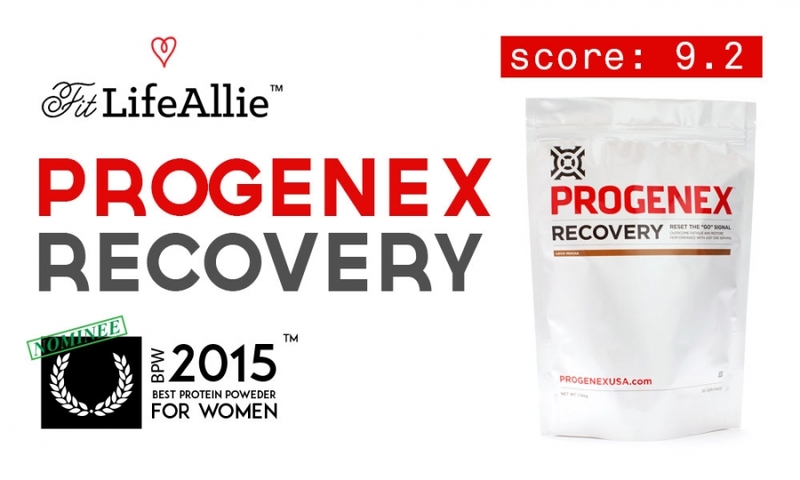 The main ingredient in Progenex Recovery is hydrolyzed Whey Protein Isolate. It’s pretty clear to me why Progenex made Recovery with the world’s fastest-absorbing protein. Crossfit could be the most demanding form of exercise on the planet. By the end of solid ‘Murph’ you’re just about ready to jump off a bridge. Well maybe not that, but if nothing else, your muscles are totally shot. That’s why Progenex aptly named Recovery is built the way that it is. Hydrolyzed Whey protein is rapidly absorbed by the digestive system to make sure you are recovering as fast as possible, and ready for the next ‘Fran’. Ugh. Even the name makes me shudder. Lol. But I love it. Other ingredients in Progenex Recovery include natural cocoa powder for flavor, natural flavors, fructose, and some sucralose. I don’t mind the sucralose because it really is the only way that they could’ve nailed the flavors the way that they have. The other thing to keep in mind is that with probably about 5 grams of real sugar per shake, they most likely did not need very much sucralose to make Recovery as sweet as it is. I think 5 grams is the equivalent of 2-3 sugar packets. Think of that level of sweetness in a 12 ounce beverage. It’s pretty significant. So that’s pretty much all there is to say about Progenex Recovery in terms of ingredients. It’s super minimalist, like I said. It’s about as natural as you can get (while still making it taste good), and I think they’ve done a really nice job with it. Would I have liked to see a bit of micellar casein in here? Yes. It is more expensive, but the benefits of taking a blended protein supplement have been proven time and time again. That’s why I’m a little bit surprised that a company that has such focus on athletes performance didn’t take notice of that. But hey. We can’t all be perfect, right? But I’ll tell you what IS perfect about Progenex Recovery: the packaging. Progenex Recovery Protein is getting one of the first perfect scores on packaging that I’ve ever given out. Ever. You probably know by now that I just do NOT give out perfect scores. They are earned. And they are rare. But when a good job is performed- I am the first one to give credit where the credit is due. Progenex USA, you should be proud that your Recovery Protein is getting a perfect ten on the packaging here in my review. The white is so perfect for this product because of how well it echoes the brand and product purpose. The overall minimalist them is so effectively communicated visually with this packaging that I couldn’t help but just turn it over in my hands and appreciate it’s nuances for like fifteen minutes when I first got it. You’d think I was describing a work of art. LOL. Aren’t I, though? I think great packaging is paramount in the supplement industry, and it’s part of the reason why I’m a huge Progenex fan. Their branding and packaging is so totally on point. Just look at this masterpiece! The Progenex emblem and company name dominate the fop third of the packaging in a confident statement of brand-recognition. The name ‘Recovery’ sits just below and is a clean-reading notification of what sits inside. Even the name ‘Recovery’ is minimalist without being cheap or basic sounding. Everything about this labeling gets me. The color block flavor bar is totally understated but so perfectly matched for the design. I could go on and on about Progenex Recovery packaging, but I think I’ll let you grab some for yourself and pick out your own favorite parts from here. Let’s wrap it up.